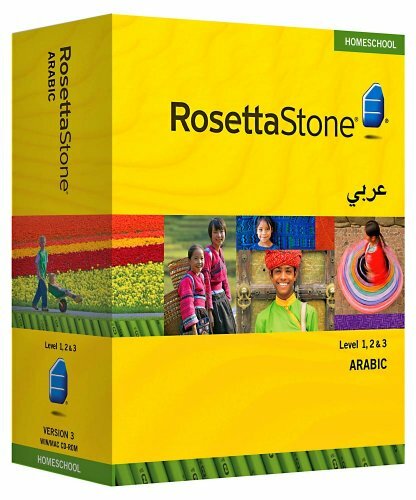 Foreign language learning with Rosetta Stone© Version 3 Arabic Levels 1, 2 & 3 will enable you to connect with the world around you. With Level 1 you begin learning fundamental vocabulary and essential language structure, from greetings and introductions to simple questions and their answers. You will soon gain the confidence to talk about your environment; give and get directions, tell time, dine out, go shopping and enjoy basic social interactions. In Level 3 you will reach an advanced level of competence where you will learn to share your ideas and opinions, express your feelings and talk in detail about everyday life; your work, current events and much more. And, Rosetta Stone Audio Companion™ allows the learner to practice their new language anywhere: in the car, at the gym or on-the-go! What is Audio Companion™? Audio Companion CDs provide activities that correspond to the Rosetta Stone CD-ROM software lessons. The learner can listen to Audio Companion and reinforce what they've been learning on the computer, turning on-the-go time into productive language practice time. Audio Companion lets the learner access the power of Rosetta Stone whenever and wherever they want. Play the CDs in the car, or download them to a MP3 player and take it with you anywhere. Audio Companion truly empowers the learner and extends the total learning time - even with a busy lifestyle! والصلاة والسلام على اشرف المرسلين وعلى اله وصحبه الاطهار اجمعين. Are there fresh link? All links are dead.